An iOS tutorial for complete beginners that shows you how to make your first iPhone app, from scratch! 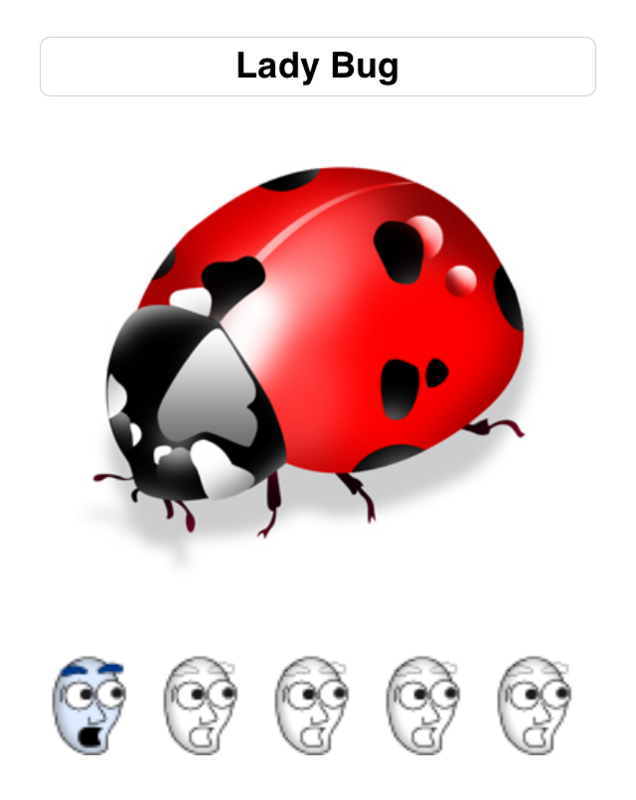 Apparently this Lady Bug isn't very scary! Update 6/02/14: Fully updated for iOS 7 by Jorge Jordán. 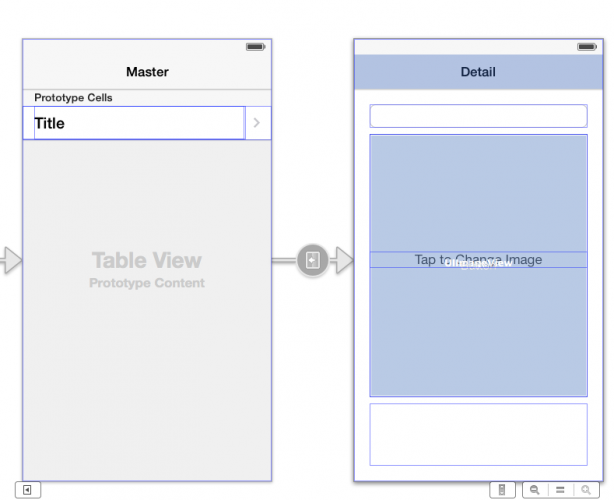 This iOS tutorial is the second part of a three-part series on how to create a simple iPhone app for beginners. And this app happens to be about rating scary bugs! 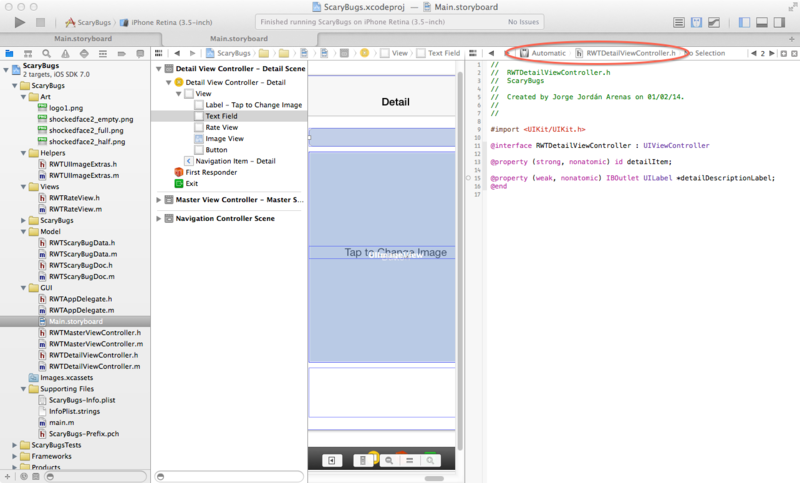 In the first part of the iOS tutorial series, you created an app that contained a list of bugs in a table view. 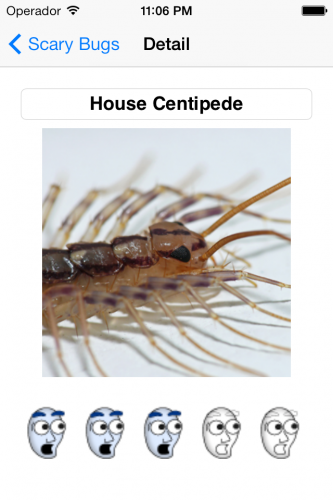 In this second iOS tutorial, you’ll learn how to create a detail view so that you can view a larger picture of the bugs, rate them, and change their pictures! In the third and final iOS tutorial of the series, you’ll learn how to add new bugs, add an icon and default image to your project, and handle long-running operations. Now that you have a list of bugs, it would be nice to be able to tap on the bug to bring up a screen where you can edit the bug’s name or picture, and rate the bug. Most of the time in iPhone apps, for every screen of the app you have a class that is the View Controller for that screen. Right now your RWTMasterViewController appears on startup, which contains a table view. You will make it so that when you tap a bug, it brings up the RWTDetailViewController, and shows some info about the bug. When you first ran the template, this was actually working, but when you changed the objects displayed by the table view (your bugs instead of the XCode’s template NSDate objects), tapping rows no longer sends the correct object to the detail view. You’ll fix that soon. Each View Controller can contain multiple views. 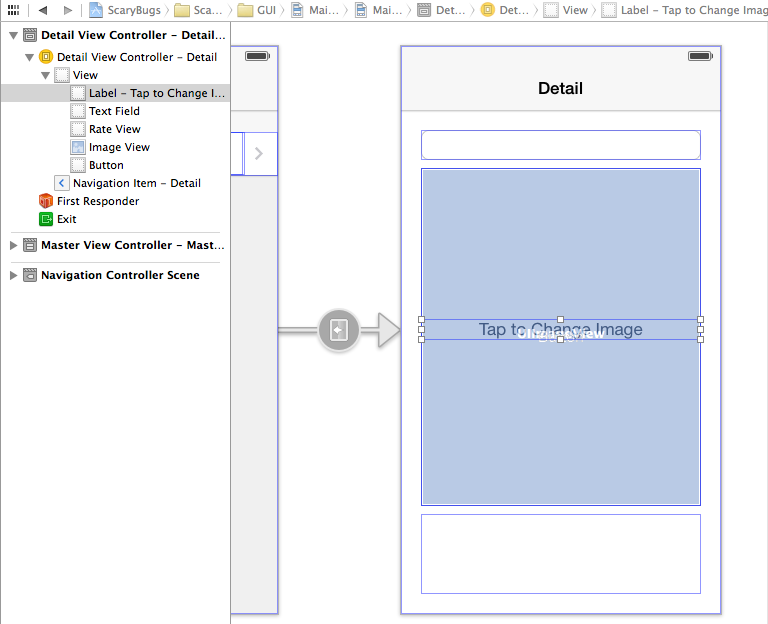 In your table view controller, you just had a single view – the table view. However in your details view controller, you’re going to need a bunch of views – you’re going to need a view for the name of the bug, a view for the image, a view for the rating, and several others. Speaking of which – you’re going to need a 5-star rating view in this details screen – but the iPhone doesn’t come with one by default. However, I recently wrote an iOS tutorial on How To Make a Custom UIView in iOS 5: A 5-Star Rating View, so you’ll just use the view from that iOS tutorial again here. Don’t worry about going throught that iOS tutorial now (unless you feel like it) – instead you can just download the Extra Stuff for Scary Bugs package that I put together for this project. Create a new group named Views in XCode, and drag RWTRateView.h/RWTRateView.m to that group, making sure Copy items into destination group’s folder (if needed) is checked. Also make sure the target ScaryBugs is checked. This is the 5-star rating view code from the iOS tutorial. Repeat for RWTUIImageExtras, except drag them to a new group named Helpers. This is some helper code you’ll need to resize images a bit later on. Repeat for the logo1.png, also drag that to the Art group. You’ll be setting that as the app icon later. The Storyboard Editor provides a visual way to construct your user interface in XCode. 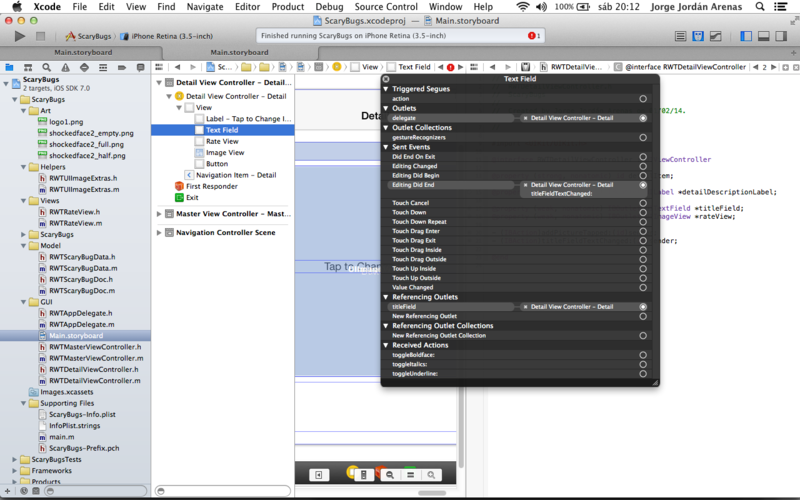 You drag and drop UI elements onto your view, set up their properties the way you want, and you can even connect the elements to properties in your View Controller classes. The easiest way to understand it is to try it out! First, click on the view controller and go to Editor\Canvas\Show Bounds Rectangles – this will make it easier to see how you’re laying out the controls on the screen. Delete the label that says Detail view content goes here – you won’t be needing that! Then select the UITextField and in the sidebar top section, make sure the fourth tab (the Attributes Inspector) is selected, so you can change some properties. 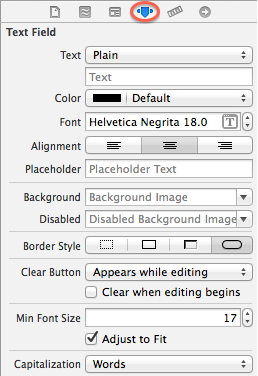 Then, switch over to the Size Inspector by clicking on the fifth tab of the sidebar. This will make it so that when your view gets rotated to landscape, the text field stretches across the screen to become wider. This makes the Image View grow or shrink to fill the available space, while keeping its edges the same distance from the edge of the screen no matter what, and scale the image to fit the best it can within the space while maintaining the image’s aspect ratio. This makes it so it stretches left to right, but always stays the same height. So far, so good! Next you need to add a few more controls to the screen so that the user can tap the UIImageView area to change the picture. There are a couple ways you can do this, but one easy way it to create an invisible button on top of the UIImageView, and set it up so that you get a callback when the button is tapped. You can also add a UILabel underneath the picture to say “Tap to Change Picture” if there is no picture set. If something isn’t right, don’t worry – just change it back to Portrait and double check the settings. Phew! You’ve added all of the controls you need, so all you need to do now is hook everything up to their outlets in your class. Then control-drag from the Text Field down into RWTDetailViewController.h, right before the @end. A popup will appear allowing you to hook the Text Field up to a property in your class. Name it titleField, and click Connect. You also want to make it so when the button is tapped, a method gets called on your class. To do this, control-drag from the Button right before the @end, like you did when connecting the other views. 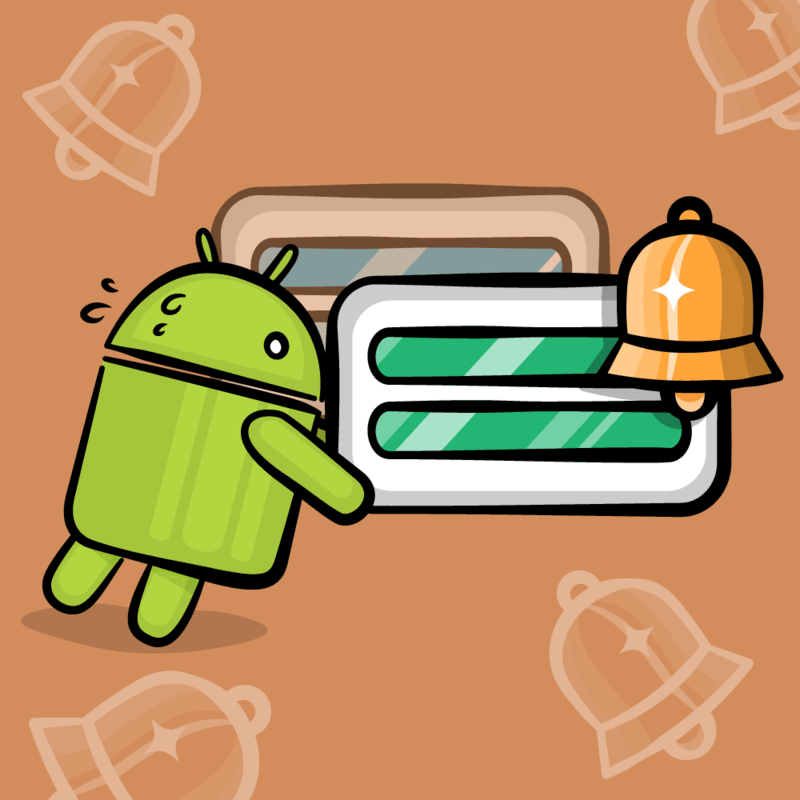 However, this time select Action as the connection type, name it addPictureTapped, and click Connect. Notice how it by default selects the “Touch Up Inside” event for you. This is good because it means when the user’s finger moves up from the button (i.e. they tapped it), your method will be called. You can connect other actions to callback methods too. For example, there’s an action on the text field when the text changes, and you want to get a callback when this happens. To do this, control-drag from the Text Field right before the @end and also set it to Action. By default it sets the event to Editing Did End – change this to Editing Changed. Name the method titleFieldTextChanged, and click Connect. The last thing you have to do is set your class as the delegate of the text field. Sometimes receiving callbacks on actions of a view isn’t enough – they might have other information to tell you about, and the text field is an example of this. To do this, control-click on the Text Field, and drag a line from the little circle to the right of the delegate entry up to the Detail View Controller, and release. You may notice some funky types above – IBOutlet and IBAction. These are “magic keywords” that the Storyboard Editor looks for, in order to allow you to associate controls that you add in interface builder to properties on your class. Basically, if you put an IBOutlet or IBAction next to a property/method, Interface Builder will detect it so you can hook it up later. 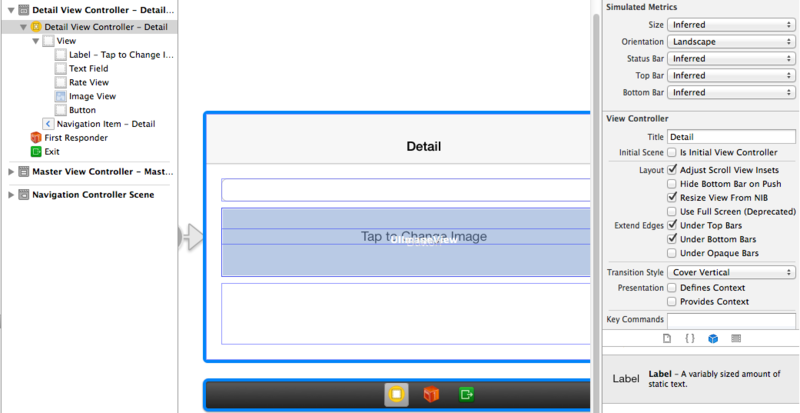 By creating these with the Storyboard Editor, it already connected the properties to the controls for you automatically, but you can see the connections by control-clicking on one of the Detail View Controller. These things are called outlets btw. OK finally done setting up the layout and header file – onto the implementation! 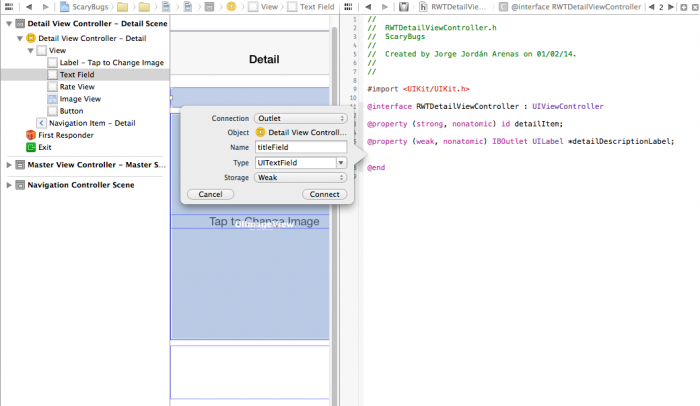 You’re going to make a bunch of changes to RWTDetailViewController.m. There’s a lot of code here, so you better go over it part by part. You should be a pro at this by this point! In configureView (which is called from viewDidLoad), you set up the properties of your RWTRateView. 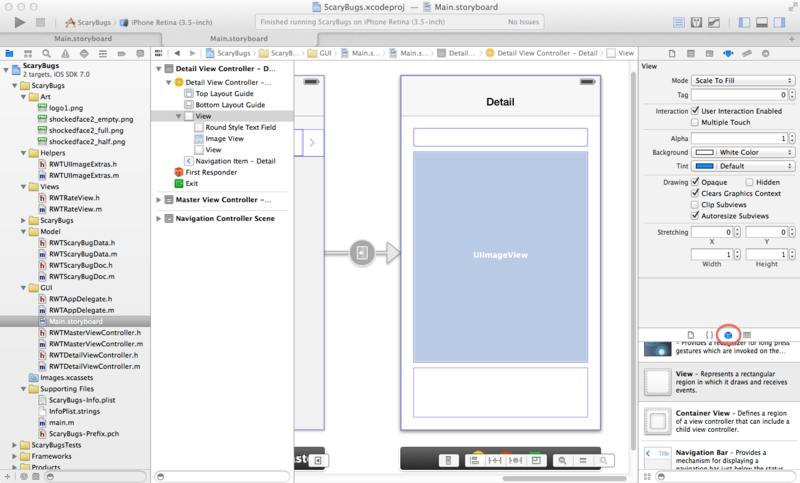 For more details, check out the How To Make a Custom UIView in iOS 5: A 5-Star Rating View tutorial. 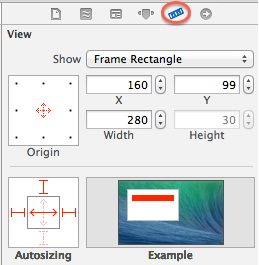 In shouldAutorotateToInterfaceOrientation, you return YES since you went to do all the work of setting up the autosizing attributes in Interface Builder! This will allow the user to rotate this view between orientations, and your controls will re-layout according to the autosizing attributes you set up. Here you simply set up your GUI based on the bug that was selected. You set up titleFieldValueChanged to be called whenever the user changes the value of the text field, so you update the model as well whenever it changes. textFieldShouldReturn is called when the user hits the return key on the keyboard. You call resignFirstResponder to get the keyboard to disappear off the screen when that happens. rateView:ratingIsChanged is called when the user chooses a new rating since you set yourself as the RWTRateView‘s delegate, so when that happens you update your model. You set up addPictureTapped to be called whenever the user taps the invisible button above the UIImage, so here you create the UIImagePicker (if it doesn’t exist already), and set the photo source to photo library (you can choose other things such as camera as well). You set yourself as the delegate so you can get callbacks when the user finished picking the picture. Finally, you present the image picker as a modal view controller, which means it takes up the whole screen. Finally, you implement the image picker callbacks for when the user picks an image or cancels. Either way, you dismiss the modal view controller. If the user did pick the image, you get the full image and also a thumbnail version (which you resize with the RWTUIImageExtras class that you added earlier), and update both the model and the view. 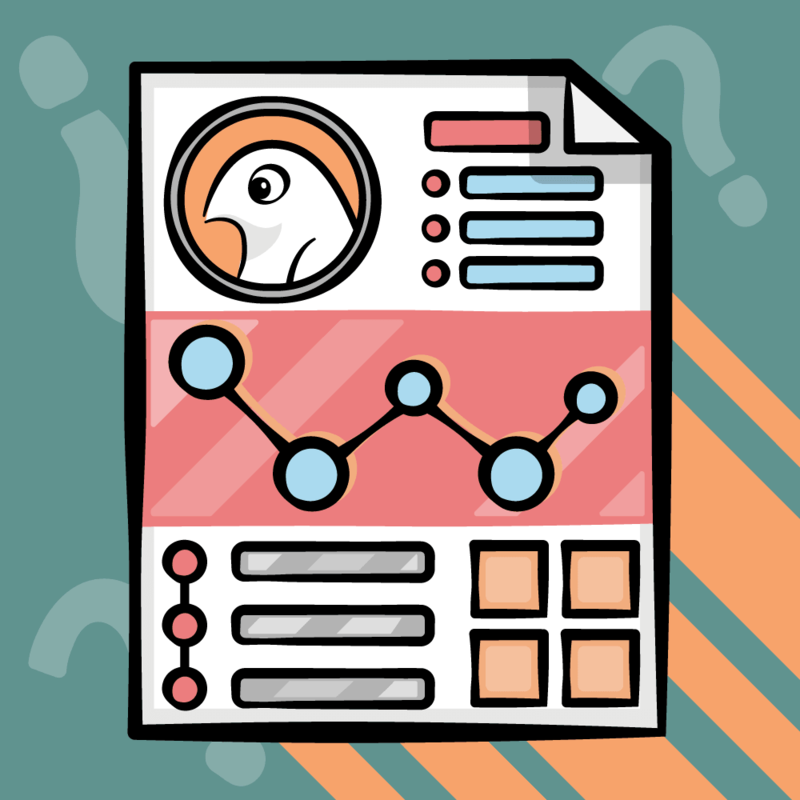 OMG – you’re probably sick of writing code now eh? Don’t worry – you’re almost done, just gotta hook this baby in! First, note that in didMoveToParentViewController, you reload the data in the table. This is because when the user is in the detail view, they might change the name of the bug or the picture, and you want the updated name/picture to show up when they come back to the table view. One easy way to do that is to reload the entire table, so you do that here. 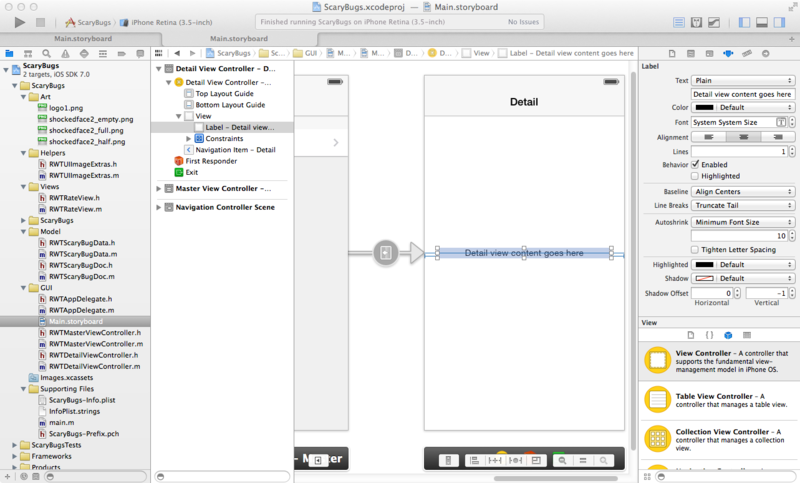 Next, remember that you set things up in the Storyboard Editor that whenever a row is tapped, it will push the Detail View Controller onto the stack. When this happens, the prepareForSegue will be called, so you have a chance to give the detail view controller any information it needs. In this case, you simply pass the selected bug on to display. Finally, you’re done! Go ahead and compile and run your project, and if all goes well you should now be able to bring up the bug detail view, change the names of the bugs, change their pictures, rate them, and even rotate to any orientation! 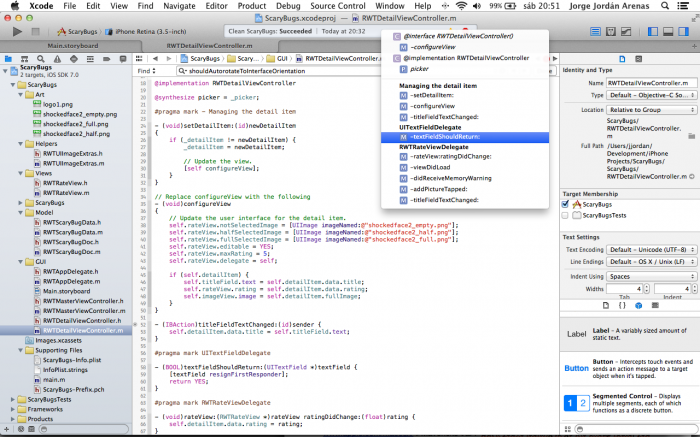 Here is a sample project with all of the code you’ve developed so far in this iOS tutorial series. Please let me know if anything in the above is confusing or if you’d like me to go into more detail about anything. 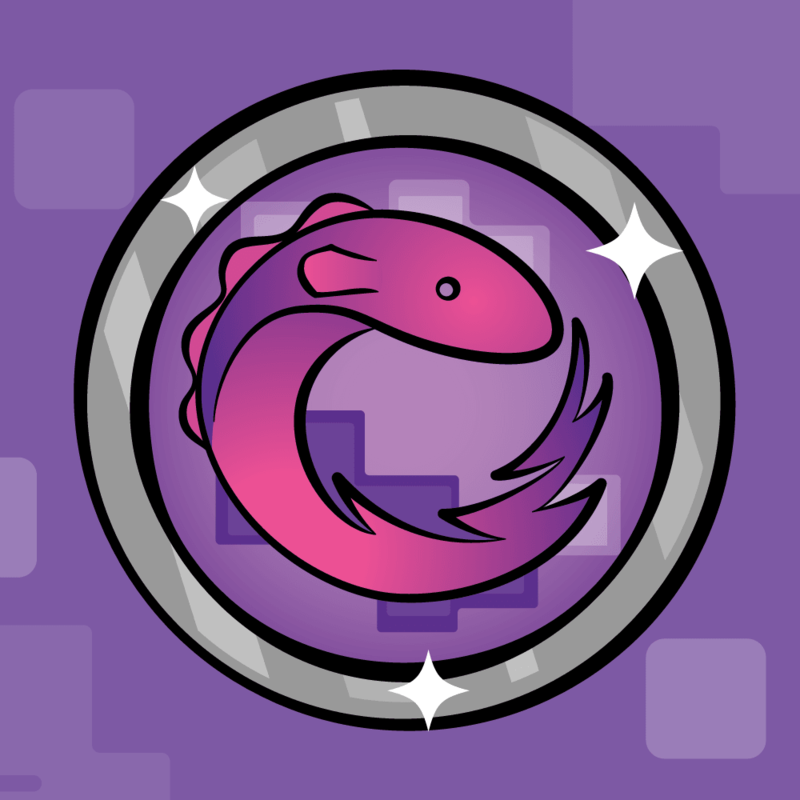 In the final part of the series, you’ll learn how to add and delete bugs, add an icon and default image to your project, and correctly handle long-running operations!